Athens, Greece: The Acropolis The sacred rock on which the ancient temples stand is roughly 16 meters high and 16 X 260 meters in area. This natural defensive site was occupied from around 3,000 BC and fortified with a massive Cyclopean wall around 1,200 BC. On the advice of the Oracle of Delphi, these walls were pulled down in 510 BC, a move the Athenians had cause to regret only 30 years later when the victorious Persians sacked and burned the buildings on the Acropolis along with the rest of the city. The construction of the site of the Acropolis began in 5th c BC, during the “Golden Age” of Pericles, under the supervision of Pheidias. A great number of architects and sculptors participated in the creation of this project offering a great diversity of skills and contributing talents. The rock of the Acropolis consists of four monuments in an organic architectural complex. The Propylaea form the main entrance to the sanctuary of Acropolis, and are made entirely of pentellic marble, combining two architectural styles: Doric and Ionic. On the right side, as you ascend the Sacred Rock, you can see the Temple of Athena Nike, also known as “Apteros Nike” (Wingless Victory). It is a graceful Ionic building with four columns on each end. It is said that after the victory of Athens over the Persians at Plataea, the Athenians cut off the wings of the Victory so as to keep her forever in their city. On the northern side of the Acropolis stands the Erechtheion, which is believed to be the most sacred of all the structures. The eastern side was dedicated to Athena Pallas, the patron goddess of the city, and the western side to Poseidon, the god of the sea. The south side is the tomb of Cecrops, the mythical founder of the city, beautifully decorated with graceful columns. It is an outstanding example of Ionic architecture. The artist used the statues of six “korai” or Caryatids as columns, a combination of feminine elegance, beauty, and inner strength able to support the temple with unique devotion. The Parthenon — Temple of Athena Parthenos (Athena the Virgin) stands on the highest point of the Acropolis, a symbol of the height of political and artistic expression of the city. The construction of the Parthenon began in 447 BC. The building was constructed in pentelic marble and is Doric in style, but has many features of Ionic architecture. It is a building of divine harmony full of dynamism and wisdom, surrounded with eight Doric columns at each end, and seventeen on each side. The Temple is divided into the “sekos” and the “adyton”. In the sekos stood the statue of Athena Parthenos, created by Pheidias and made of gold and ivory. 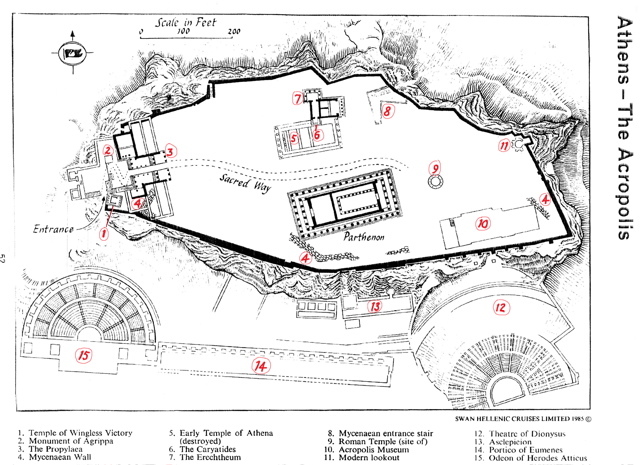 The adytum is where the goddess’ treasure was kept and was also used as the state treasury of Athens.